Smita qualified as an Optometrist in 1983. She brings almost 30 years of optometric training and practice, an open but discerning mind, and information about a broad scope of treatment and vision enhancement options. She spent her early career working in the Contact Lens Department of Moorfield Eye Hospital and in the independent sector where she built up a contact lens practice whilst gaining her diploma in Contact Lens Practice. In 1991 she opened her Practice in north London, UK, providing a full range of Optometric services including eye care of children and contact lenses. 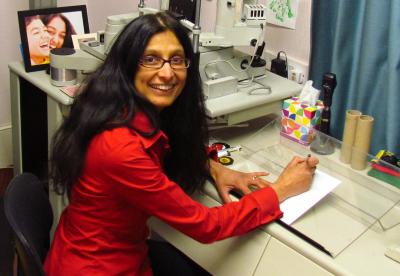 Smita has worked in the Specific Learning Difficulty Clinic at the Institute of Optometry, London and recently (2010) authored a chapter in a book: "Tooties: Learning to learn" (see Chapter 10 pp137-150). Her areas of interest include all forms of treatment for optical, visual efficiency, visual perception problems and strabismus. She has a strong background in nutrition, sports, personal performance and provides vision therapy for both adults and children. Several times a year she travels abroad to attend conferences and training. Smita has a proactive approach to eye care with her patients benefitting from a unique level of clinical care. You can read testimonials from her patients here.